People are always asking me for my spinach quiche recipe and I've always blown them off, because I don't know. I throw eggs and cream and cheese together, pour it in a crust and bake it until it's done. Sometimes, I use sour cream and/or half and half. Sometimes, I use milk. Other times, when I'm feeling decadent, I use heavy cream. I can tell if the egg to dairy ratio is right by the way the batter looks. It's more a guess than a science. Finally, after all these years of winging it, I've taken the time to measure stuff and take notes. I did it for you so basically, you owe me. 1. Beat the eggs and add the half and half and cheeses. You can use any cheese. I usually make it with just Swiss, but Boursin adds a ton of flavor. If using Boursin, just crumble it in. 3. Season to taste and pour in your crust. I used a pre-made crust but you shouldn't do this if you want to be taken seriously. 4. Bake at 350 degrees for 1-1.25 hours or until set. Check it after an hour. On Saturday, we went to Indianapolis for the PTA Reflections Award Luncheon. We missed the Canterbury School garage sale for this. Parenting is mainly about sacrifice. 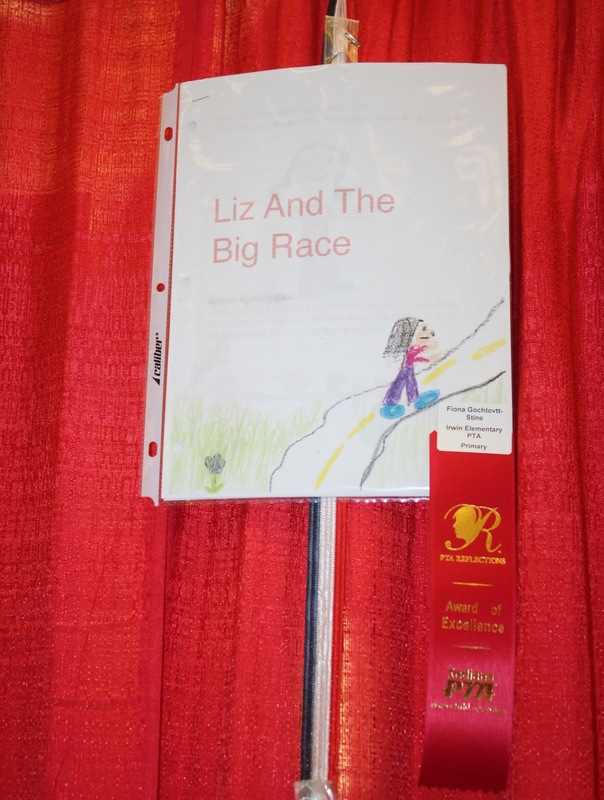 Fiona won the Award of Excellence for Literature for a short story she wrote, titled, "Liz and the Big Race". It's your classic and heartwarming tale of the underdog girl who wants to run in the so called "big race" despite the fact that she is smaller than the other runners. The heroine is bullied by the other kids but she perseveres and, of course, WINS THE RACE! In the end, the bullies apologize and Liz and her mom go out for ice cream to celebrate. I wouldn't be surprised if this wins the Caldecott award some day. I have no idea who the two women are. I think they're important Indiana PTA people. We stopped by Sol Fest at Fox Island on Sunday. Kids seriously love getting their faces painted. They will happily wait in line for hours (actually, 45 minutes) for this experience. Cyd had picked out a pink princess mask design. When it was finally her turn she pointed to her selection and told the face painter, "also, I like rainbows". Because of course she does. Needless to say, she was quite pleased with how it turned out. Cyd doesn't really know how to pose for photos. Standing still is not her thing. Fiona, on the other hand, has learned there's no escaping the posed photo with scenic background. Do they give out medals for being the most adorably sweet sisters? The way you let your daughters play and learn is an expression of how not a "Tiger Mom" you are! I love seeing all the photos and stories you post of Fi and Cyd just playing! This is childhood!